In eukaryotic cells, chromosomes are found in a special compartment called the nucleus. The nucleus is a defining feature of eukaryotic cells, which range from single-celled yeasts to plants and humans. In contrast, bacteria and other prokaryotes are more ancient in evolution and lack a nucleus. The development of the nucleus contributed to the evolution of complex life forms by separating transcription (reading of genes , occurring inside the nucleus) from translation (protein synthesis, occurring in the cytoplasm ) and by providing a structural framework for organizing and regulating larger genomes . In multicellular organisms, individual cells can express different subsets of genes and thereby form specialized tissues such as muscle or skin. 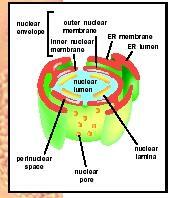 The nuclear envelope surrounds the nucleus and creates and maintains a special environment inside it. The envelope consists of two nuclear membranes (inner and outer), nuclear pore complexes, and the lamina, a fibrous network. The nuclear membranes form an impermeable barrier. The outer membrane faces the cytoplasm and is part of the endoplasmic reticulum (ER). The inner membrane faces the chromosomes. Movement into and out of the nucleus occurs through pores (holes) where the inner and outer membranes are fused together. However, the pores are not empty; nuclear transport is controlled by nuclear pore complexes, each consisting of about a thousand proteins ("nucleoporins"). Each pore complex is large enough to accommodate the passage of ribosomal subunits, large protein-RNA (ribonucleic acid) complexes, which exit the nucleus after being assembled in the nucleolus. Illustration of the nuclear envelope. The third major component of the envelope, the nuclear lamina, is found in multicellular eukaryotes (including humans), but not in single-celled eukaryotes or plants. (The plant nucleus evolved independently; less is known about its structure.) The lamina is a meshwork of fibers, formed by the head-to-tail polymerization of proteins named lamins. These fibers are concentrated near the inner membrane and also extend throughout the nuclear interior. Lamins are a type of intermediate filament protein and are strong yet flexible. Humans have three lamin genes, which through alternative messenger RNA (mRNA) splicing can produce seven "flavors" of A- and B-type lamin proteins. Different cell types, such as muscles and neurons , express different combinations of lamins. Lamin filaments are key architectural elements in the nucleus. Beside providing structural stability, lamins also provide attachment sites for other proteins inside the nucleus. Biologists are discovering a growing number of proteins that bind to lamins. Lamin-binding proteins such as LAP2, emerin, and LBR are anchored at the inner nuclear membrane and also bind to chromosomes. This results in two-way and three-way attachments between the inner membrane, lamina, and chromosomes. When purified nuclei are treated with salts and enzymes to remove most proteins and DNA, what remains is a three-dimensional filamentous structure named the nuclear matrix. The composition of the matrix, and whether it includes lamins, has been controversial. However, deoxyribonucleic acid (DNA) replication machinery is stably attached to the matrix. Thus, the matrix may provide a scaffold that allows the orderly replication of chromosomal DNA, and possibly other activities inside the nucleus. Chromosomes fill much of the nuclear interior, with each chromosome occupying its own neighborhood. In differentiated human cells, sectors of each chromosome are structurally compressed to prevent gene expression . This repressed chromatin , termed heterochromatin, is often located near the nuclear envelope. Other sections of chromosomes are loosely extended ("euchromatin"), making these genes available for transcription and mRNA processing at the surface of compact chromatin. Proteins responsible for transcription and mRNA processing are highly mobile and move rapidly within the aqueous spaces between and surrounding the chromatin fibers. There are also two specialized structures inside the nucleus, which are factories for making multiprotein "machines." The nucleolus is the factory where ribosomes (the translational machines) are assembled. Nucleoli form around the genes that encode ribosomal structural RNAs. Cajal bodies (coiled bodies) are smaller round structures that are proposed to be factories for assembling "transcription machines" responsible for transcribing genes into mRNA. In mammalian cells, the nucleus organizes about 0.7 meters (2.3 feet) of DNA inside a sphere approximately 5 microns in diameter. Remarkably, this structure is completely disassembled when mammalian cells undergo mitosis . Nuclear disassembly is triggered by mitotic phosphorylation of key structural proteins, including lamins, lamin-binding proteins, and nucleoporins. Phosphorylation causes these proteins to change conformation and release each other. Released nuclear membranes merge into the ER network, whereas released lamins and nucleoporins disperse throughout the cytoplasm. These components are then recycled to form two nuclear envelopes, soon after the two sets of daughter chromosomes are segregated. During nuclear assembly, membranes reattach to chromosomes and fuse to enclose the chromosomes within one unified envelope. Pore complexes assemble and begin importing nuclear proteins that were released during mitosis, including lamins. The lamins reassemble into filaments, and the condensed chromosomes expand as the envelope expands to its full size. Few of these steps are understood at the molecular level. In the nematode worm, C. elegans, which has only one lamin gene, lamins are essential for life. Lamins are also important, either directly or indirectly, for nuclear shape, nuclear stability, chromatin attachment to the envelope, spacing of nuclear pore complexes, chromosome segregation, completion of mitosis, nuclear assembly, and the elongation phase of DNA replication. In organisms with multiple lamin genes, the "extra" lamins appear to have specialized functions. For example, the lamin A/C gene is expressed mostly in differentiated cells. People who inherit one mutated copy of the lamin A/C gene develop one of three different diseases: the autosomal dominant form of Emery-Dreifuss muscular dystrophy; dilated cardiomyopathy with conduction system disease; or Dunnigan-type familial partial lipodystrophy (loss of fat tissue). Cardiomyopathy and lipodystrophy are correlated with missense mutations that change one amino acid in different regions of lamin A. Missense mutations might prevent lamin A/C from assembling properly, or might prevent its recognition by one or more binding partners. The loss of emerin, a membrane protein that binds lamins A/C, causes the X-linked recessive form of Emery-Dreifuss muscular dystrophy. These diseases are not yet well understood. However, lamins and laminbinding proteins may provide attachment sites needed by other nuclear proteins. For example, retinoblastoma, a transcriptional repressor critical for cell growth control, associates with the nuclear lamina. Insight into the functions of the nucleus may help to alleviate some diseases. Cohen, Merav, Kenneth K. Lee, Katherine L. Wilson, and Yosef Gruenbaum. "Transcriptional Repression, Apoptosis, Human Disease and the Functional Evolution of the Nuclear Lamina." Trends In Biochemical Sciences 26 (2001): 41–47. Gerace, Larry, and Roland Foisner. "Integral Membrane Proteins and Dynamic Organization of the Nuclear Envelope." Trends in Cell Biology 4 (1994): 127–131. Lamond, Angus I., and William C. Earnshaw. "Structure and Function in the Nucleus." Science 280 (1998): 547–553. Wilson, Katherine L. "The Nuclear Envelope, Muscular Dystrophy, and Gene Expression." Trends in Cell Biology 10 (2000): 125–129. German biologist whose experiments with sea urchin eggs and embryos showed that the cell nucleus contains some substance that can, by itself, determine what kind of animal an egg will develop into. Boveri rightly predicted that humans inherit traits on the chromosomes.